Directions to Daydream Island Info. An island only 1km long and 500m wide, Daydream Island is a private, dream destination set on pristine white sandy beaches, and surrounded by crystal clear water and vivid coral reefs. Located in the heart of the Whitsundays alongside the most beautiful reef in the world, the Great Barrier Reef, Daydream Island is a true tropical paradise for all the family. Just 5km's from the mainland, the island has three beautiful beaches which are fringed with stunning corals, the home of vibrant tropical fish. These are the best places to snorkel and enjoy the wonders of the ocean, but inland at the centre of the island you can become an explorer in the dense, protected jungle, which is home to different wildlife in the form of colourful parrots and beautiful sunbirds. Daydream Island is a complete experience with natural beauty and excellent service; an island which has become an established favourite with families and couples alike. 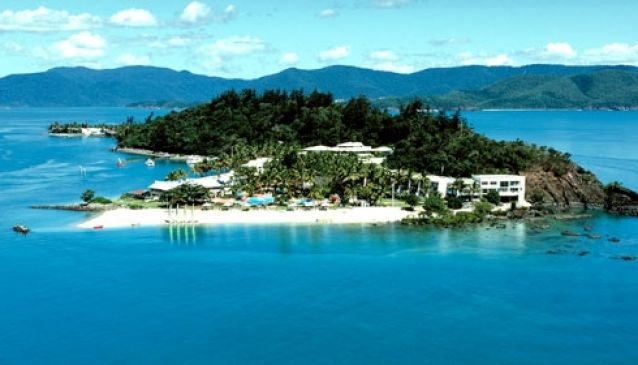 Daydream Island is simply too small to have its own airport, but that's not a problem as Hamilton Island Airport and the Whitsunday Coast Airport are both nearby. If you choose to fly into the Great Barrier Reef Airport on Hamilton Island, Daydream Island staff will be waiting for you on arrival. They will whisk you to the jetty, just a few steps from the airport's arrival gate, and lead you to a spectacular, sleek, top class catamaran for your transfer to the island. Your holiday starts here as you enjoy the warm sunshine and cool breeze from the deck, whilst you sit back and enjoy the views of the Whitsundays as you sail by. For guests arriving at the Whitsunday Coast Airport, a coach will be waiting to take you on a 30 minute drive along the coast to Abel Point Marina at Airlie Beach. From here, you will board a comfortable ferry for your transfer to the island. However, if you like to make a grand entrance, guests also have the option of an exclusive heli-charter service, for a spectacular bird's eye aerial view of the Whitsundays. • The Live Reef - Daydream Island is unique, so unique that it has its very own man-made lagoon and live reef. There are opportunities to walk with baby de-barbed stingrays, to stroke sharks (don't worry they're friendly baby Gummy sharks not Jaws), to touch leathery sea cucumbers or watch the colourful clown fish as they dart through the water with their friends. It's an experience not to be missed by guests of all ages. • For the kids - being an island there are lots of beach activities including games and volleyball courts, fish feeding, scavenger hunts, coconut bowls and perhaps the most fun of all, the crazy golf course. Around Australia in 19 holes is said to be the most amazing course in the southern hemisphere; adults love it as much as the kids. • On and under the water - There are snorkelling and diving opportunities with professional instructors, jet ski adventures, parasailing, boat hire, glass bottom boat fishing, water skiing, plus the use of catamarans, kayaks, and the action packed tandem parasail and tandem jet ski experiences. • Rejuvenation Spa - for true relaxation, revitalization and complete body and mind pampering, visit the island's spa. The spa offers massages and body treatments including facial renewal and entire body care. There are absolute indulgence packages and personal makeovers for guests looking to dress and impress. • Cinema under the stars - Sit back in comfy chairs, popcorn at the ready, and enjoy films on the big screen with the ocean as a backdrop. All cinemas should be like this. • Weddings - A little more than merely something to do, romance and happiness are what Daydream Weddings are made of. Experienced wedding planners can arrange weddings to suit all tastes and budgets, from traditional or casual to something a little funky. Whether you choose the beautiful chapel overlooking the ocean, the palm lined white sand, or a sunset wedding on the beach, whatever your style and budget, the experience will be magical. The day starts with a leisurely buffet breakfast overlooking the ocean. Lunchtime offers the opportunity for a poolside snack, or something more substantial, and to finish the day enjoy a private and romantic table for two on the beach. Lit only by flaming torches and the moonlight, these romantic dining experiences are accompanied by the sound of the ocean, making them the perfect end to the perfect day. With seven restaurants and bars to choose from dining is never boring, and add to that private meals and in room snacks, Daydream Island dining is a dream. With 296 rooms and suites just steps from the beach and the ocean, every guest will find something to suit their taste and budget. Every room has been designed for comfort and pleasure with air conditioning, but it is the views which truly make these rooms and suites unique. There are rooms with spectacular rainforest gardens; this is where you wake in the morning to the sounds of tropical songbirds just outside your window, or rooms with reef and ocean views where the sound of the waves lull you into a deep sleep, and wake you totally rested, and ready for another day in paradise. Choose a balcony room which boasts uninterrupted views or a patio room where you can bask in the sun and be in the ocean within seconds, there are also special interconnecting family rooms designed to keep even the biggest of families together. In addition to the standard rooms, the resort also offers very special suites in prime locations of the resort. These suites boast awe-inspiring views and service which is second to none. • Overlooking Lovers Cove, the Reef Suite with its large balcony and a spa tub ensures you relax and get into the holiday spirit. The suite is perfect for honeymooners and wedding couples. • The Daydreamer Suite has a wonderful bedroom, spacious living area, large balcony and a spa bath to soak in and soak up the amazing view of the ocean. • The Panoramic Suite and the Ocean Paradise suite are utterly perfect; both provide exclusive views of the ocean, private balconies, gorgeous open-plan designs and special personal touches ensuring your holiday is the holiday of your dreams. With its white sandy beaches, beautiful sunsets and the sound of the ocean from your balcony, Daydream Island is more than just a daydream; this island is a dream come true.